After you have created your glorious new diagram in Creately you're going to want to show it off, use it somewhere else, publish it and perhaps back it up. 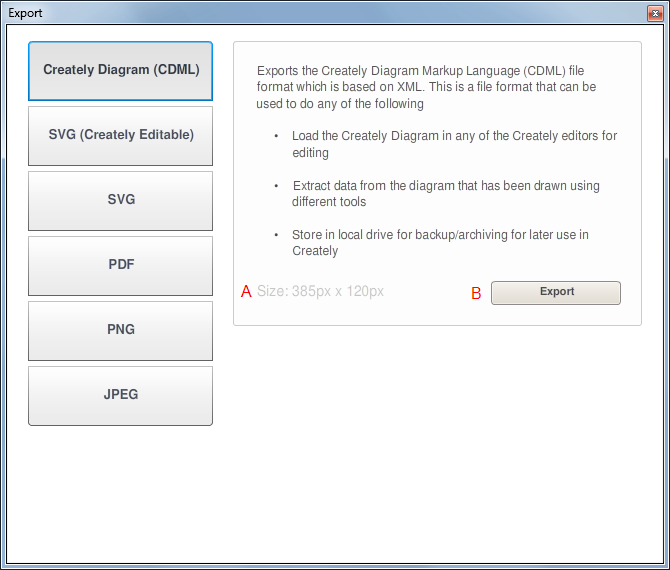 We offer a number of export options for your diagrams from Creately. Below we'll work through the various options and cover what they are best for and what the available export options mean. We all try not to be constrained by limits but sometimes for our own sanity and practical reasons limits have to applied. At the end I go through the limits applied when exporting a diagram from Creately so you can plan around it. All exports are done through the export menu and the export dialog window. 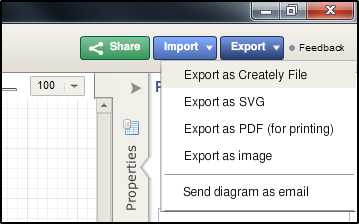 To perform an export you need to open a diagram and then in the top right hand corner select the export menu and your preferred export format. Regular SVG - just a plain vector format of your diagram. 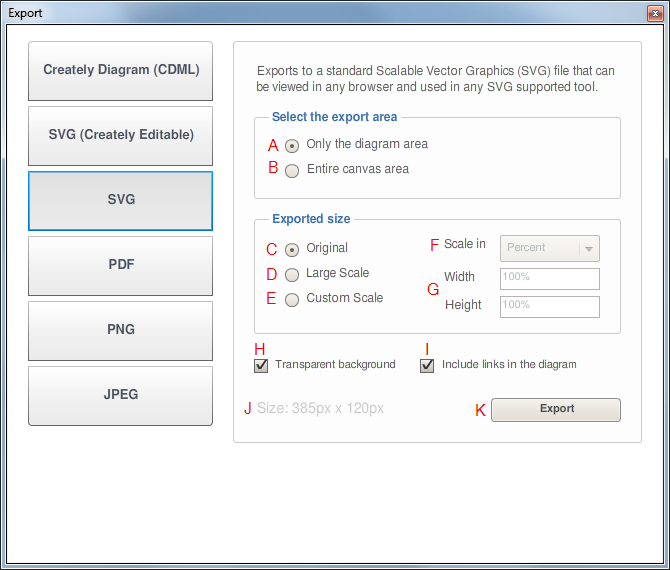 Creately editable SVG - the file format exports SVG while retaining all the Creately specific data. That means it can be imported again and edited. Which format is best for you depends on your needs. You would normally choose the regular SVG if you are going to publish the SVG version of the diagram and have no plans to import it again. The Creately editable format would be more useful if you want others to be able to view it in an SVG viewer but then have the option to load it in to their own Creately account to edit. A - Select to only include the area covered by the diagram as part of your export - best for publishing. 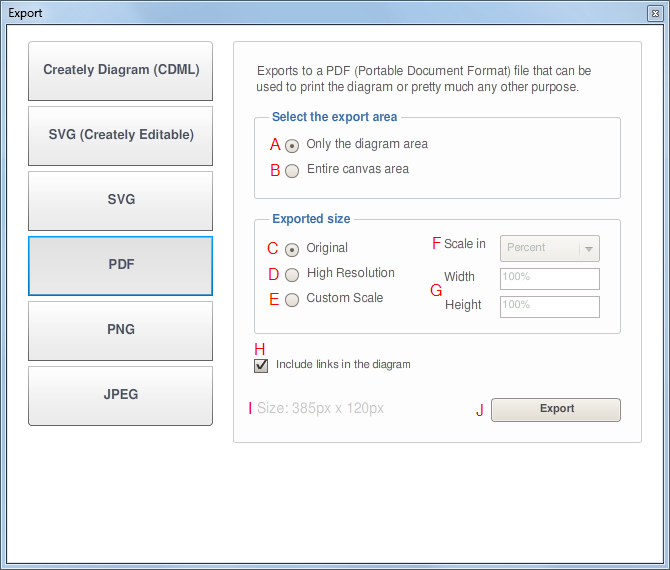 B - Select to export the ensure canvas area of the diagram - for a small diagram this can mean a lot of white space, but it's good for printing. D - Double the size of the diagram when exporting. Gives your diagram a larger scale. F - When you choose option E you can then choose which measurement to use in your scaling either percentage or pixels. G - When you choose option E you edit the height and width measurements in these fields. H - If checked the diagram background is transparent once exported, if unchecked it'll be the same colour as shown in the diagram - normally white. I - If you have included URL links in your diagram checking this box will make sure they appear in your exported diagram and they'll still be clickable. J - The final size of the export, this is here for your information. It changes as you update the "Select the export area" and the "Exported size" sections. K - Once you're ready to export click this button and the export file will be generated and you can choose where to save it locally. 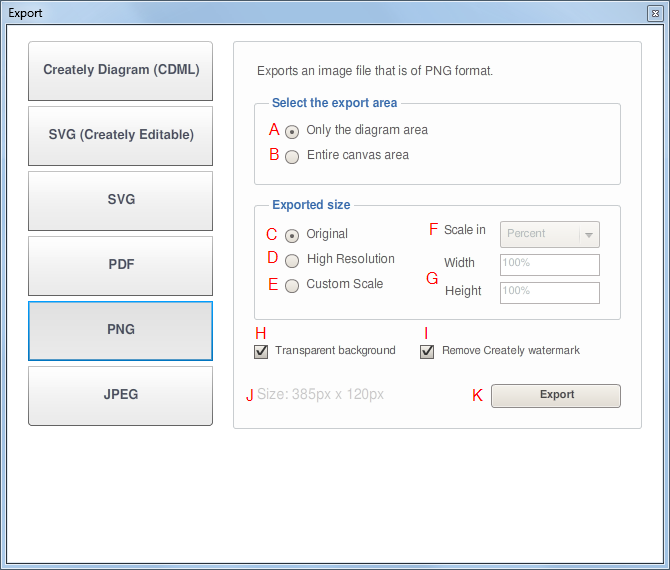 Creately has two raster image export formats. The first of which is the PNG format. This probably the best format to export if you need a regular image. It's widely supported and lossless so your exported image quality is maintained. This format is the best to use when importing to Word, Excel or PowerPoint as well as Google Docs. It is also useful to publishing online. I - If checked the Creately watermark will be removed from the diagram. The watermark normally appears in the bottom right hand corner of an exported image. If you're on the free plan the watermark can not be turned off, only premium users can disable it. Creately has two rasterised image export formats. The second of which is the JPEG format. It's widely supported and lossy so your exported image file can be a reasonable size. H - If checked the Creately watermark will be removed from the diagram. The watermark normally appears in the bottom right hand corner of an exported image. If you're on the free plan the watermark can not be turned off, only premium users can disable it. I - The final size of the export, this is here for your information. It changes as you update the "Select the export area" and the "Exported size" sections. J - Once you're ready to export click this button and the export file will be generated and you can choose where to save it locally. When you want to print your diagram then PDF is the best option for you. It is also a great format when you need to share the diagram with someone who isn't on Creately but the links still need to work. PDFs export as bitmaps. H - If you have included URL links in your diagram checking this box will make sure they appear in your exported diagram and they'll still be clickable. Moving a Creately Diagram from one edtion of Creately to another. For example moving a diagram from Creately Online or Creately Desktop to Creately for Confluence or JIRA and vice versa. The diagram can be exported as CDML and then imported again with all the diagram and shape properties preserved. Exchanging a Creately Diagram with another user where they need ownership of the diagram. Using Creately Online you can share the diagram you create with others but you can't change the owner directly. However if you export and then allow the other person to import it they then have a copy of the diagram which they will own. This could be a method for consultants to share their IP. Extracting data from your diagram. A number of Creately shapes can contain their own data and using the CDML format you could write a parser to extract or transform the CDML format and therefore obtain the data you need for input to another service. As a backup of your diagrams. If you require a separate back up of your diagrams you can export them as CDML and then at a later date re-import them. A - The final size of the export, this is here for your information. B - Once you're ready to export click this button and the export file will be generated and you can choose where to save it locally. When scaling your diagrams through the "Exported Size" section the ratio of the height and width is locked at 1:1 this means for percentage changes both fields have to be the same and for pixel changes when you edit one dimension we calculate and automatically update the other dimension. We maintain the 1:1 ratio because without it the diagram would almost certainly not look correct. For each export format the final width and height of the image will be calculated from the currently selected settings in the export dialog. In addition the page size you set through the properties panel is taken as the starting point for the size of the diagram. 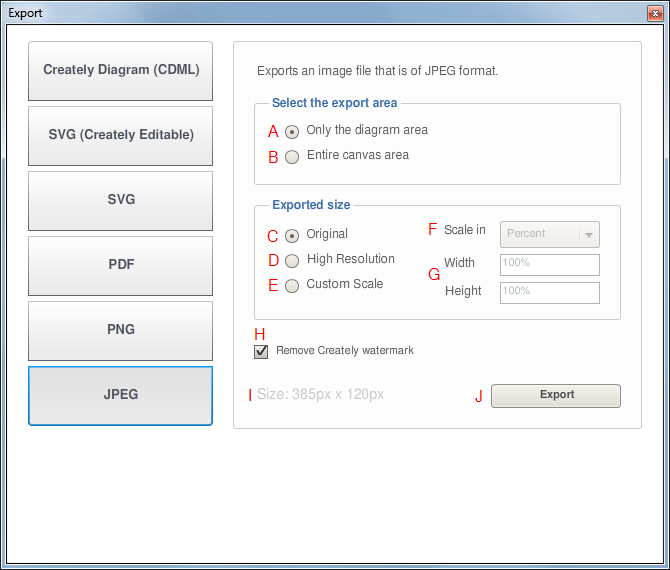 If you receive an error message when making an export in PNG or JPEG or PDF format try exporting in SVG format as that doesn't require a raster image so might be successful for you. Just to clarify, I am totally new here and totally uneducated. I need to create a diagram with hyperlinks so that when a visitor to my site clicks on a specific diagram element, he or she is taken to a specific URL. Before I start working in Creately, I need to know that this is possible? Any comments? Yes, this is possible in Creately. Please read our diagram linking option as it explains the same scenario as requested: https://support.creately.com/hc/en-us/articles/227795107-Create-Links-Between-Diagrams I can elaborate on this further, if you open a support ticket.